Voodoo lilies, or as they are known botanically, Araceae, are a family of flowering plants grown from underground tubers. Native to the Indian subcontinent and the regions around the Mediterranean voodoo lilies produce one bloom each year or less frequently in May or June with the bloom lasting for one or several days followed by the production of a decorative seed head. 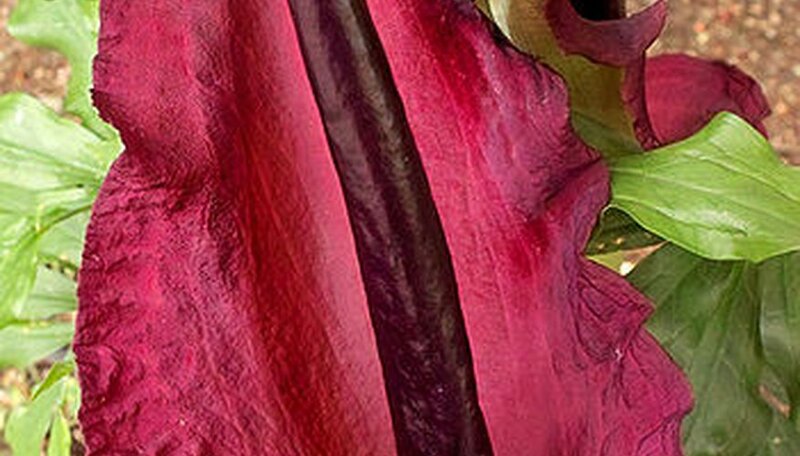 Voodoo lily blooms are known for the dramatic architectural quality and coloration of their blooms as well as the rancid meat smell the bloom produces as it unfurls. Voodoo lilies are hardy in USDA zones 6a through 11. Plant your voodoo lily in a shady locale protected from winds and frosts in well drained soil. Choose either a container that is 6 inches larger than the tuber or plant directly into garden soil. Some partial or dappled sunlight will be tolerated as well. Bury the tuber in soil between 2 and 10 inches deep in the soil, depending on the size of the tuber. If the plant is not growing from the tuber at the time of planting just make sure that the flattish root plate is facing down into the soil. Cover over with soil and water in lightly. Allow the soil to dry out somewhat during the dormancy from October through February or March. Reduce regular watering so that the soil dries out completely for 10 days or so and then water again. Repeat this watering dry out cycle and do not fertilize until the tuber comes to life in the spring and you see new growth. At that point, resume regular watering to keep the soil lightly moist and fertilize sparingly with a 10-10-10 water soluble formulation applied onto wet soil at the roots. Leave the faded bloom head in place to feed nutrients back into the tuber and allow the seed stalk to develop. Cut away any dead foliage with secateurs after it has completely desiccated. The seed stalk is ornamental and will be the only sign of life on the plant at this time because while growing the seed stalk, no foliage is produced. The seed stalk will grow and mature over a full year cycle before blooming commences again.